Join or Renew GAPA Chicago! "Enough German to be Proud!" One of the last ethnic police associations to assemble at the time. An why not? It was time to take our heads out of the sand. There was much pride in our heritage. 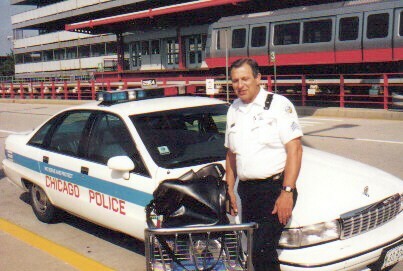 The first police officer to die in the line of duty in the City of Chicago was a German immigrant named Casper Lauer in 1854. The names of many of the streets we grew up on, the schools we attended and the parks we played at certainly reflected the influence of some of the more illustrious German immigrants. We are their sons and daughters in spirit if not in name. The reputation of German American police officers for being reliable and aggressive also did not go unnoticed. Early on there was a question as to how much German ancestry one had to have in order to be a member. It was resolved easily enough with the answer- enough to be proud! Past President Joe Kirchens, Ret. Det. (CPD) with Founder Holzinger. 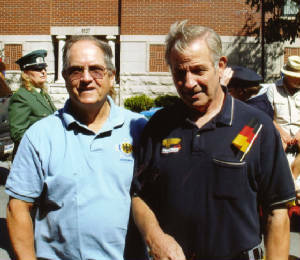 Any sworn law enforcement within the United States of German heritage who has been accepted into the membership by the Association's Board of Directors after being sponsored by a current member in good standing and after paying the required dues. An active member who after tendering the required dues to the association for a period of at least ten consecutive years, and after retiring from active law enforcement service, may qualify for retired membership. Such membership retains all the rights and privileges of active membership, however at reduced dues. Any person who has rendered distinguished service in promoting respect for the Association or the German American community, may be considered for honorary membership. Honorary membership has no voting privileges nor are they permitted to hold any office in the Association. Any civilian may obtain Associate status into the Association provided that they share the same interests and goals. Associate membership is granted only after the applicant has been sponsored by two Active members and is accepted by the Board of Directors.